A year before his assassination, Dr. Martin Luther King Jr. warned us that “when machines and computers, profit motives and property rights, are considered more important than people, the giant triplets of racism, extreme materialism and militarism are incapable of being conquered.” Such an ominous warning from Dr. King embodies the struggle that communities of color have faced throughout America, whether it’s in the streets of Harlem or Chicago. 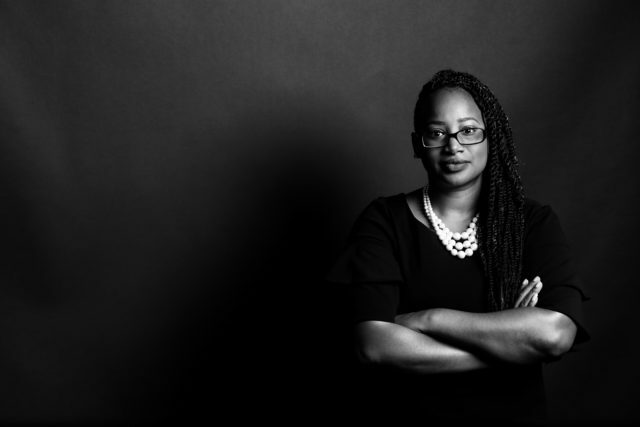 The dehumanizing prioritization is felt in rural Alabama where Black residents are being smothered by toxic coal ash while our very own government turns a blind eye to corporate malfeasance of local power plants. The countless numbers of communities like Flint, Michigan without safe, clean drinking water reiterate the troubling sentiment King shared. As with many things with the Trump administration, it feels like much of the progress we have made since the passing of Dr. King has been erased. Corporations and institutions continually devalue the lives of their employees and the communities directly impacted by their quest for profits. And this reversal is most apparent, and arguably most damaging, because of the changes that have taken place at the Environmental Protection Agency (EPA) under the Trump administration. Acting EPA Administrator Andrew Wheeler and his corrupt predecessor Scott Pruitt have systematically gutted many rules intended to protect the environment and health of all Americans. For example, Wheeler has made his next target the Mercury and Air Toxic Standards, which if properly followed would reduce dangerous levels of mercury, heavy metals, and other toxic air pollutants released from coal- and oil-burning power plants. Wheeler’s Poison Plan would have devastating health consequences for communities across the country, especially our most vulnerable, pregnant women, infants and children. This counterintuitive decision by the EPA under Wheeler embodies the “profit motives” and “extreme materialism” that Dr. King warned us about and unfortunately represent the heart of the Trump administration. 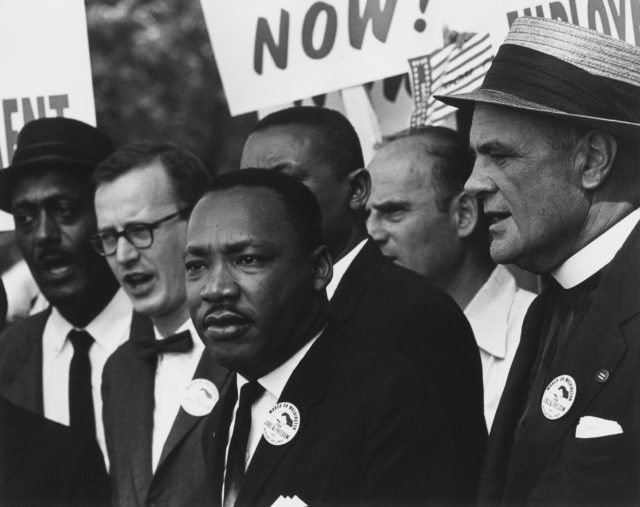 As we celebrate and honor the life of Dr. King, we must remember that his last act as the conscience of America during the Civil Rights Movement was to protest alongside the Memphis sanitation workers, advocating for safer work conditions and fair wages. Though the term “environmental justice” was not yet coined at the time, many in the environmental justice movement acknowledge the importance of his final act as planting an important seed of our movement. At the core of Dr. King’s mission was to bring attention to the importance of fair wages and employment for communities of color. Dr. King said it himself: “No work is insignificant. All labor that uplifts humanity has dignity and importance and should be undertaken with painstaking excellence.” WE ACT has embraced that mission through our Worker Training program, which has provided unemployed and underemployed members of the Harlem community with the training necessary to build careers in the construction industry. Since 2014, we have provided free worker training to more than 800 individuals, and are on course to train an additional 440 in 2019. After Superstorm Sandy, 400 residents of Harlem and other Northern Manhattan neighborhoods convened to create a community driven plan which prioritized clean and affordable energy with an emphasis on creating green jobs for the community. One outcome of that plan is our Solar Uptown Now program, which is putting rooftop solar panels on affordable housing in Northern Manhattan. The 415 kilowatt-direct current solar capacity generated by these panels will offset an estimated 4,117 tons of greenhouse gas emissions annually, which will reduce the local carbon footprint and help combat climate change. It will also reduce demand for electricity from local power plants, which helps reduce local air pollution. The 900 residents of the 11 buildings currently in the program will receive an estimated combined savings of $62,000 over the first year after installation and over $1.7 million in savings over the solar installations’ 25-year life. These savings will enable the participating buildings to reallocate funds for building maintenance and reserves, providing the co-ops with financial security and helping them maintain long-term affordability for residents of the Housing Development Fund Corporations (moderate-income, tenant-owned cooperatives). In addition, WE ACT has trained more than 90 members of the local community in solar installation, with several securing jobs installing the Solar Uptown Now panels. We have begun to fulfill our goal of a providing a just transition to clean and affordable energy in Northern Manhattan. 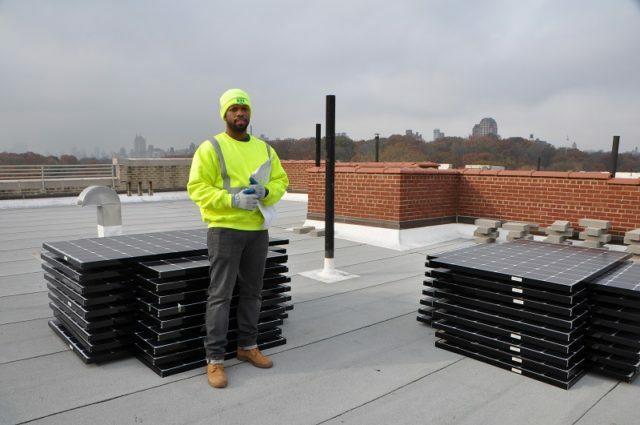 Both our Solar Uptown Now and our Worker Training programs are examples of how people of color are not only being employed in the clean energy sector but can lead in developing the solutions for their own communities. The times are different, but we must continue the work started by Dr. King during his final march. We must continue advocating for and producing good jobs and safe, healthy working environments for our communities to thrive.